Knowing what to expect following your LASIK surgical procedure can help you to be better prepared to follow the post-operative instructions provided to you by your ophthalmologist, and to ensure that you are not unpleasantly surprised by any of the expected post-operative side-effects and potential complications. The majority of LASIK patients will see an almost immediate improvement in their vision after the procedure. Their vision will continue to improve as their eyes go through the healing process. In general, the cornea is the fastest healing tissue on the human body. That is the reason why sutures are not necessary to hold the flap in place while it is healing. 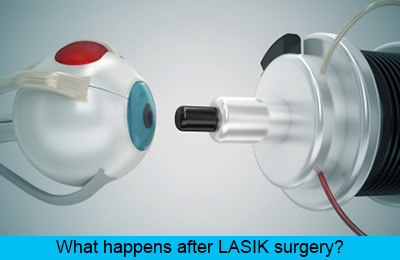 The flap created by LASIK begins to heal immediately once the flap is replaced and will be secure within 2 weeks. However, the healing process will vary from person to person. The entire post-operative healing process can actually take up to several weeks. Each person’s eyes are different and you may find that your vision is completely perfect on the 2nd day post surgery and don’t suffer any post-op complications. Or you may have slower healing and experience some side effects associated with LASIK such as increased light sensitivity, blurred vision, halos surrounding lights, and also poor vision at night. Some LASIK patients find that their night vision doesn’t truly reach the levels that they were hoping, and may still need to wear corrective lenses for nighttime driving. Almost every LASIK patient will experience some level of dry eyes after the procedure. Immediately following the surgical procedure, patients report that their eyes feel a little bit scratchy and somewhat gritty. Your ophthalmologist will prescribe several eye drops that will help to ease the symptom of dry eyes and also help to ease any potential inflammation that you may experience after your LASIK surgery. It is vital that you follow the recommendations given to you by your doctor during the recovery period in order to ensure that you have the best chances of a completely successful LASIK surgery. Some of the guidelines that you could expect your surgeon to provide you with may include the following. Your ophthalmologist will also conduct several follow-up exams in order to monitor the healing process and carefully evaluate your overall eye health as your vision improves. While you will definitely see a great improvement in your vision after the procedure, it is not entirely unexpected to experience fluctuations in your vision as your eyes go through the healing process. Be sure that you reach out to your general eye doctor or to your ophthalmologist if you are at all concerned about the changes that you are experiencing. If your vision has not been restored to the levels that both you and your LASIK surgeon were expecting, then you may be a good candidate for a LASIK enhancement. While only a very small number of LASIK patients need an enhancement, this form of surgical re-treatment can have a great improvement on the patient’s vision if the original procedure did not produce optimal results. The unsatisfactory result of a LASIK procedure may be due to a number of factors, but most often it is hard to pinpoint the exact reasons; it is often thought to be related to atypical healing of the cornea however. All LASIK patients still go on to develop a condition known as presbyopia if they havn’t had it already to begin with. This is when you start to lose your ability to focus on near objects and occurs in just about every person after the age of 40. While the original nearsightedness, astigmatism, or farsightedness may be treated effectively with the LASIK procedure, once presbyopia occurs, former LASIK patients will still likely need reading glasses. The most important part of your LASIK surgery is to ensure that you maintain effective communication with both your LASIK surgeon and with your general eye doctor. The better communication that you have with them as you relay details of your recovery, the better help you will be able to receive in the unlikely event that you suffer from some of the complications seen in some LASIK patients.